You may find the information on this page is boring and hard to remember. However, if you want to know more about spiders, it is the minimum information that you have to know. The scientific name of spiders is Araneide, which is an order under class Arachnida. Arachnids are invertebrate animals which belong to a large group known as arthropods. All arthropods have a exoskeleton and jointed limbs. Other major arthropod groups are insects, crustaceans (shrimps, crabs), chilopods (centipedes) and diplopods (millipedes). 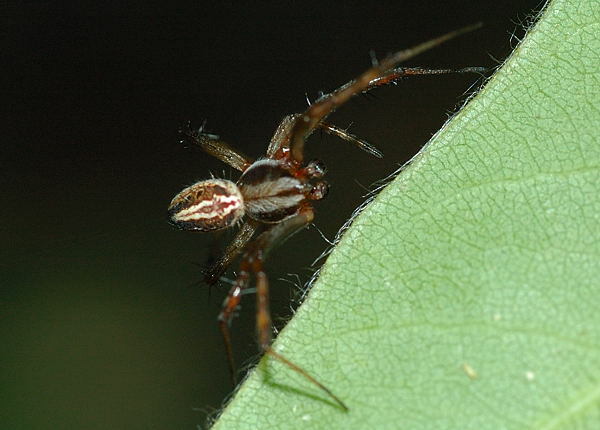 All Arachnida members have four pairs of legs and one pair of chelicerae. There are nine orders in the Arachnida, besides spider Araneide, the other common order is Scorpionida (scorpions). The body of spider is divided into two regions; the cephalothorax and abdomen. The cephalothorax carries six pairs of limbs: the chelicerae, pedipalps and four pair of legs. The pedipalps of male spiders are modified to be used as copulatory organs. On the cephalothorax there are also the eyes and the mouths. The abdomen carries the opening of the book-lungs, the tracheae, the genital and spinnerets. Spiders digest their food externally. They secrete their saliva that contains enzymes which can decompose the prey body. Once their food is liquefied, the liquid is sucked into the stomach. Food is then store in the midgut. There is a brain and ganglion in the cephalothorax. Nerves from the legs and abdomen connect to the ganglion. The heart is a long tube which runs through the abdomen and consists of several chambers. Spiders breath by book-lungs which are in the front part of the abdomen. Spider have different types of silk glands in the abdomen which produce silks for different purposes, such as web building, eggs sac, drag line and retreats. Spider lay eggs after fertilization. The eggs hatch and the young go through several instars stages before they become adults. There are the moltings in between each instars stages. After moulting, the spiders will increase in size and sometimes change colour. 4. Capture spiral - very sticky, to snare insects, stretch 3x its length before breaking. 5. Dragline or safety line - used to anchor webs and serve as spokes, has a high tensile strength.. Most spiders will leave a dragline wherever they go. It is believed that the male find the female spider by following her dragline. 6. To build egg sac - all spiders use silk to build egg sac for the protection of their eggs. This is the primary purpose of spider silk. 7. To build retreat - some spiders do not build web. They build retreat using silk between leaves, in bark or in soil. 8. To warp around prey - most web building spiders and some non-web building spiders use a bundle of silk to warp around their prey before feeding on it. 8. Kiting - spider let go a bundle of silk, wind blow the silk and carry it to the other end, and attached. 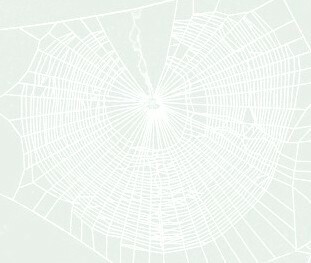 Details can also be find on our How spider builds web page. 10. Ballooning - most young spiders distributed by ballooning. When the young spiders grow strong enough to leave their mother, they hold a short length of silk and wait for the wind. When there is the wind, because of their light weight, the wind carry them to the sky as someone holding a big balloon in air. The highest record of animals in the sky is not the flying bird nor the flying insect. It is the ballooning spider. Our visitor Alex in our guest book asked why insects fly into the spider webs. A dragonfly caught in a spider web. Insects fly into spider webs only because they do not know there are spider webs. 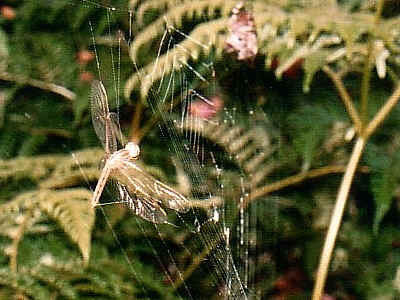 Spiders build webs on where most insects will fly pass, such as between two trees, near the flowers etc. Some spiders build webs at night and most spider web are almost invisible. Even we human being are sometimes walk into spider webs during bush walking. See more on how spider capture prey on web by clicking here. Last updated: October 22, 2009.